Like every other math teacher I know, I love me some math history. Mathematicians are just some of the craziest people to read about and study, I'm sure of it. I'm also sure that putting historical context into what you're studying helps you remember it more. 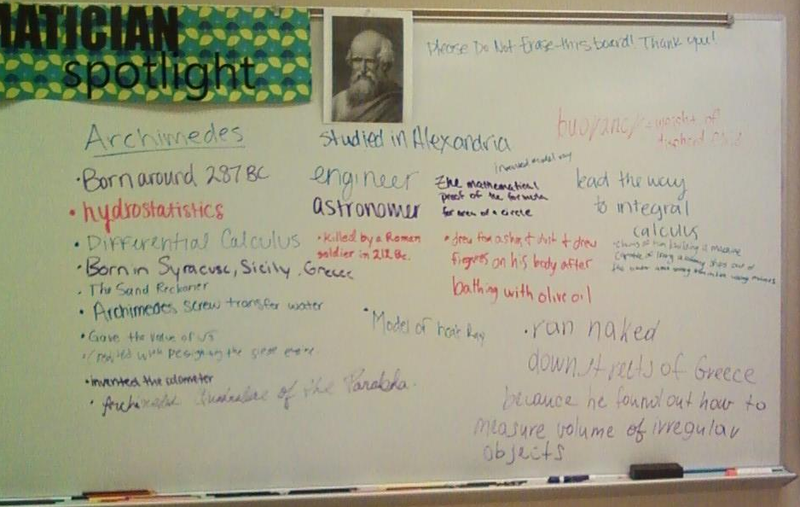 In Pre-Calc this year we've had a new mathematician for each unit we've covered. The mathematician correlates to what we're studying (sometimes I do a better of job of picking the mathematician than other times). 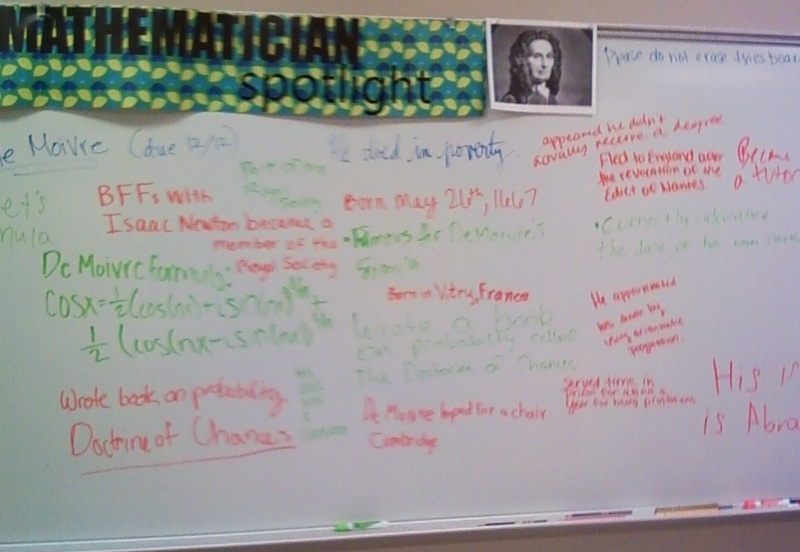 If students write a paragraph about said mathematician and then write a fact on the white board, they get bonus points for that unit's test. The catch is that they have to write something new on the board. So, the longer they wait to do the assignment, the harder it gets, because the dude's birth and death dates go pretty quick. 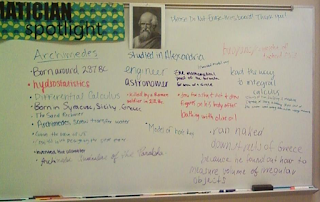 One unexpected outcome of this has actually been my Algebra II classes' response to this board. 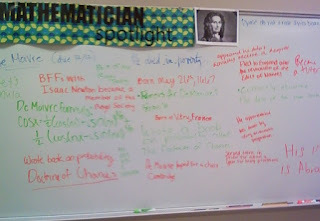 They'll see something they think is interesting and it starts a conservation about our spotlight mathematician. [Read: kids are excited about math!] I've also heard them say things like, "Mrs. Peterson! Wasn't that a super smart answer?! Maybe my picture and name should be on that white board!" To which I usually reply something snarky. But, the point is that they're finding mathematicians cool, and that makes my heart happy. 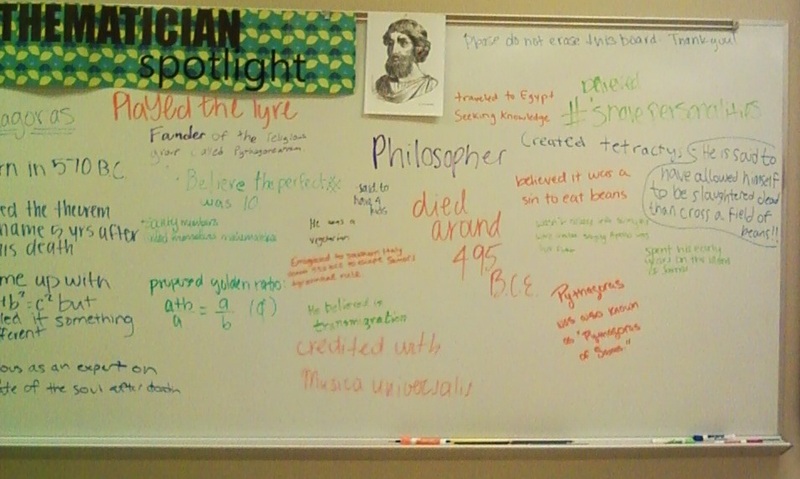 Here are the mathematicians we've done so far, in chronological order. I think the kids are getting the hang of it. 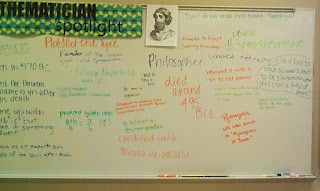 I still have a long ways to go in incorporating math history; there's much more that can be done here. But, I'm learning. And so are the kids. Neat idea! I don't think most students appreciate that the math they see collected in textbooks year after year is stuff that these guys had to make up from scratch years ago. I guess the same could be said for many of the subjects students study in school. There was a time before we knew x, y, or z. What was life like then? Thanks for sharing! Hy .... :) Really nice post you have shared with us. I am totally agree with this idea. I will bookmark this page and share with others. Thanks for sharing with us. Well I really enjoyed studying it. This tip provided by you is very helpful for good planning. Thanks for sharing it. It's normally entirely difficult and in the meantime amusing to play earth biking diversions. Stunt biking is again demonstrated on genuine biking. Stunt biking recreations include the player doing diverse complex moves or tricks for acquiring focuses.